We've been looking forward to the 3-day weekend and are taking a much needed break! We hope all our readers had a nice holiday! We'll be back on Friday with a new post. According to the CDC, nearly 66% of infants in the United States are cared for by someone other than their parents on a regular basis, half in child care centers and the other half in home-based care (child care provider or family member). In the past, Kerri has written about her experience going back to work after the birth of her daughter, Jen B has provided tips for deciding if you should bring your baby to work and tips to make working with baby easier, and Jen G posted information about secondary caregivers of children in various countries around the world. Given that so many babies in the US are cared for outside of the home, the majority of parents must take on the important and daunting task of finding a child care provider whom they trust with their young child. It can be hard to know where to start when making such a significant decision. What questions should you ask? What should you look for when seeking a trustworthy caregiver or daycare center? In today’s post, we will examine some vital questions to consider while searching for a childcare provider or center for your baby. Don’t wait too long to start looking for child care for your baby. Many centers have a lengthy waiting list that could be a year or more in length – though it may seem premature, getting on the wait list while you’re still pregnant is necessary for some centers. If you are pregnant or have a newborn and are considering childcare for your infant it can be helpful to make a list of questions and important things to look for before touring the centers. A list can help ensure you don’t forget your questions! Before committing to any center, tour it without your baby so you can observe the teachers without getting distracted by your own baby. If possible, arrange to visit during a snack or lunch break - pay special attention to how they accommodate younger babies who are not yet eating solids while the older infants are eating. If you feel comfortable with the provider, go back with your baby one more time and plan to spend at least an hour to observe. If you are breastfeeding, you will need to find out how breast milk is handled at the childcare facility. Many centers require you to bring the milk in bottles, and other centers may accept it in bags. Ask if the milk can be brought frozen or just refrigerated. Also make sure to inquire about how the milk is heated (milk should be heated in warm water, NOT in the microwave because it can cause hot spots that can burn the baby). The center may have specific ways they would like the milk to be labeled so that there are no mix-ups! For breastfeeding moms, find out if there is a private place for you to nurse your baby at the childcare center. If you work nearby, you may decide to come to the center at your lunch break to drop off more milk or to feed the baby yourself. Ask the providers how they know when to feed a baby. Do they only use strict schedules or use crying as a sign of hunger or do they look for other cues? How do they determine when a baby is full or finished eating? Also, once you choose a provider, don’t be afraid to tell them how your baby shows hunger and fullness cues. Ask about how the facility handles multiple babies’ feeding and napping schedules. Do they want the infant to conform to their schedule, or does the center adapt to each infant’s schedule? This may be an important aspect that contributes to your decision choose a provider or to keep looking. The American Academy of Pediatrics recommends that babies be put to sleep on their backs to reduce the risk of Sudden Infant Death Syndrome. During your visit, pay attention to how other infants are put to sleep and discuss how babies are positioned to sleep with the provider to be sure that this recommendation is followed. Help your provider by sharing how you know your baby is drowsy or overstimulated. This will make the first few weeks easier until the provider gets to know your baby and can pick up on the cues herself. Ask about the provider’s policy about parents calling to check on their babies. There may be some times that are better to call than others and just a quick over-the-phone confirmation that your baby is doing well can ease your mind. Remember, there are many childcare centers; if you don’t feel comfortable at one, keep looking. Don’t feel like you need to settle on one because it’s convenient or close to your home or work. There may be other options available that more closely meet family’s needs. Placing your infant in childcare can be a difficult transition for both you and your baby. 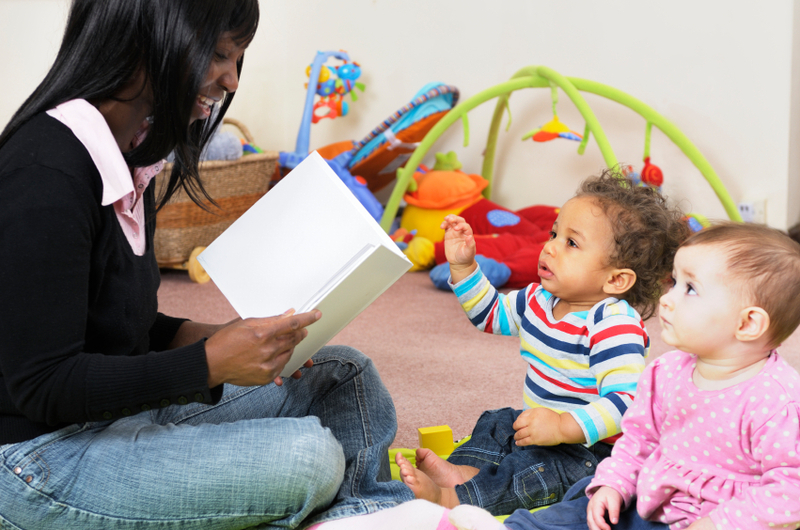 Working with your childcare provider ahead of time can make the process easier for everyone! 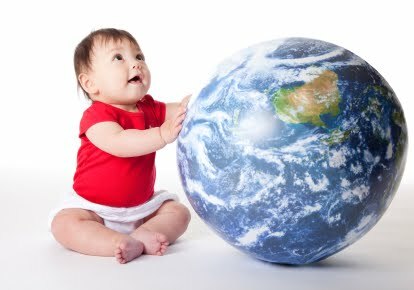 We're happy to share a new series with you called Baby Behavior around the World! This series will be a bit different from those we have done in the past because it will consist of several posts interspersed with our regular postings over the coming months. With each Around the World post, we will be exploring caregiving practices around the globe and comparing how they are similar or different to those in the United States. Without further ado, let’s talk about key caregivers of babies in different areas of the world. The need for a strong, healthy attachment between caregivers and infants is biological and an important part of caring for babies in every part of the world. Such attachments can positively influence babies’ social behavior and development. Understanding normal Baby Behavior is important for all caregivers of infants, especially since many different people, in many different settings, care for infants and contribute to infants’ growth and development. Many developing countries raise children in groups, receiving support from multiple generations of family, friends and neighbors. This “village” of caregivers may be more likely than families who are more isolated to pass on some of the messages we have found so important such as how babies sleep and how they communicate with caregivers to get their needs met. In many cultures, care of children is often shared by the greater community and it is expected that children will not be exclusively raised by their parents. Adults in a child’s surroundings (not just the biological parents) are trusted to provide care for the child. For example, children raised in rural, semi-nomadic households in the Sahara are raised by groups of mothers and sisters in the community. These female networks support each other in providing food and childcare. Meanwhile, in some villages on the Ivory Coast of West Africa, every member of the village is expected to visit each newborn as soon as possible after birth to encourage relationships between the child and members of the community. In Bali, mothers carry their babies in slings and are able to hand them over to nearby villagers whenever help is needed. In this society and others, elder women in the community play influential roles in caregiving of children. With the recent recession, the number of children being raised by grandparents has risen in the United States. According to the U.S. Census Bureau (2008), 1 in 10 children in the U.S. now live with a grandparent, an 8% increase since 2000, with the majority of that increase after the beginning of the recession in 2007. 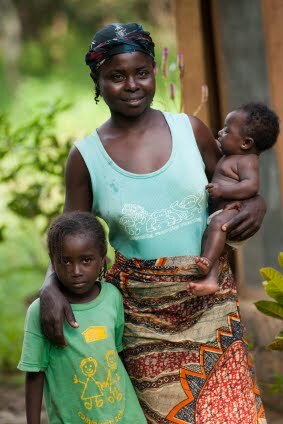 In many countries, however, older women have always played a large role in caring for children in the family. Not surprisingly, one Finnish study found that there were many advantages of having other supportive caregivers, such as grandparents, available to care for children (yes, they studied that!). This study of the “Grandmother Hypothesis” indicated that mothers live longer and age slower when they receive support from their own mothers. Caregiver support provided by grandmothers or other female relatives often consists of child rearing advice, physical and emotional help, and an opportunity for children to develop a healthy connection with many potential role models. For example, African households follow a “hierarchical transmission of knowledge” from elder to younger female members of the family (such as mother-in-law to daughter-in-law) in caring for sick children. Also, in Chinese culture, a central role of older women is to care for children in the family and facilitate the passing on of child rearing traditions from generation to generation. In our next installment in this series, we'll share what we've learned about recent trends in parents' roles in caring for babies and young children. Your Turn: Who are the key caregivers in your baby’s life? How have these roles changed as your baby has grown? 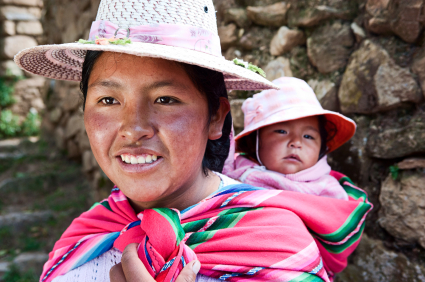 We are excited to introduce a new series about caregiving of infants and infant behavior around the world. Throughout our blog, we have shared infant caregiving and parenting practices of infants in the United States, but how are these practices different (or similar) in other countries? And while infant behavior is biologically driven, and thus the same across all cultures, how do caregivers in other countries deal with and respond to their infants' behavior? Starting this week we will share a new “around the world” topic every Friday, and with readership extending from the United States to Australia, India and 7 other countries, we want to hear from you too! Each week we will give you an opportunity to share your experience and insights about parenting and caring for infants in your local environment. This Friday: Who is the primary caregiver of infants in different cultures? In today’s post we conclude our series on bringing your baby to work. Last week, we provided a list of issues to address when deciding whether bringing your baby with you to work is right for your family. If after these considerations, bringing your child with you is the best option, then you will want to consider the following tips on how to balance the ever precarious see-saw of employment and parenting at the same time. As you may know, I was able to bring both of my daughters with me to work when they were infants. Today, we are sharing some tips from our experience of having my daughters in the office over the last 3 years. You may feel like you aren’t giving 100% attention to your job or your baby at all times. THIS IS NORMAL. Even if your baby was at day care, you’d still be thinking about her while separated. To achieve a sense of balance, I try to spend a few minutes just playing with Charlotte several times each day and when she’s napping I work on my most important tasks. That way I am giving both my work and my daughter one-on-one attention at various points through the day. There will be days when you get a lot done and others when you don’t. I have found that making a list of my tasks helps a lot. Every morning, I write everything I have to do, even the smallest tasks, on a piece of paper and cross each item off as it is completed. For me, having the piece of paper right in front of me keeps me focused and seeing items crossed off makes me feel I accomplished something. Having a flexible work schedule makes it much easier. When Charlotte was younger, she didn’t mind being in the office all day, but now that she’s getting more mobile and social, I have found that she can handle being in the office for only about 5 hours before she has a meltdown. To make it easier on her (and on me and my coworkers), I have been leaving the office a few hours early and continue working from home while she naps in her crib. There have been many days when she needs my full attention, so on these days, I just stop working until my husband gets home and then start working again after dinner. There are also days when I have work deadlines and I can’t be distracted. On these days, my husband stays home or I ask a friend to babysit. Like we’ve mentioned many times, babies love routines. Establishing work-time routines may be beneficial for both you and your baby. For example, you can feed her in the same place each time, take a walk during lunch, and aim for naps at the same time each day. While you might not be able to stick to the routines 100% of the time, trying to keep some things the same will help your baby know what to expect, and can help you plan your day better. Keep duplicate baby gear in your office. If I had to lug around a play mat, bouncy chair, pack of diapers, blankets, toys, etc. back and forth from my car to the office, I’d probably have bigger biceps by now – but fortunately I don’t have to. I already have to carry Charlotte, her stroller, my work laptop and lunch, so I find that keeping extras stored under my desk limits the cumbersome lugging of baby gear each day. Last But NOT Least - Ask for help! Getting help from my coworkers makes my workday much smoother and it seems that there is always someone eager to hold or play with the baby. While I know that what works for me may not work for everyone, I think the most important thing is to try different solutions to see what works best for you – each baby is different and the balance between work and mothering will continue to be game of trial and error. My daughters’ temperaments and physiological maturity were very different so even though I thought I knew what to expect from my experience with Olivia, Charlotte has been a new and different challenge. These are just a few of the tips I have from my personal experience, but we know there are many moms out there with stories and experiences bringing their child to work. We would love to hear your tips or funny stories about bringing your baby to work! 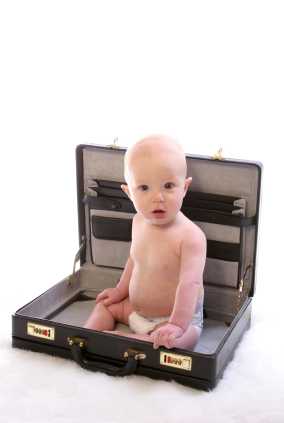 Bringing Baby to Work (Part 1): Is it right for you? We know what it’s like to come back to work after having a baby. We have been through the process of getting reoriented at work and the struggle of adjusting to new routines, both at home and in the work place. I returned to work 8 weeks after having each of my daughters, and although this is common among moms I know, my experience has been a little different because I bring my young baby with me to the office. When I tell people about this arrangement, they react in one of two ways – they either tell me I am very lucky or look at me like I’m crazy. The reality is somewhere in between. Yes, I get to spend all day with Charlotte, and I don’t have to worry about how she is being cared for, but there are days when it is challenging to balance work and parenting. The first thing you should do is review your company’s policy and discuss your idea with your boss. Unfortunately, if your employer will not allow children in the workplace, there isn’t anything you can do. If you find that there is no policy in place, you can discuss the pros and cons with your boss to determine if it is possible to try it out. If your boss seems hesitant, maybe he or she would be willing to let you have trial period of 1-2 weeks to see if the arrangement works for everyone involved. Even beyond obvious safety concerns, there are aspects of the physical environment you should consider. First, consider the size of your workspace. Babies (and their stuff) can take up a lot of room. I keep a bouncy chair and a play mat in our office for Charlotte and every day I bring a diaper bag and breast pump with me. The chair and mat fold up when not being used, but they still take up some space. I’d also like to bring in a pack-n-play, but there isn’t room. If your office is small or if you share space, you may find that storing items in the office isn’t an option. If there is room for a chair or play mat, you need to make sure that they can be put in a safe place, close to you, without blocking any walkways. In addition to space limitations, you should take into account noise, temperature, and other things that may make your baby uncomfortable. For example, if your workplace is very noisy, your baby may have a hard time taking a nap and may become overstimulated quickly. The cultural environment is also something that should be factored into your decision. How will your coworkers react to having a baby around? Will the baby impact their ability to do their jobs? In a perfect world, everyone would band together to help with the baby, but in reality, that may not be the case. Even if your workspace and workplace culture can accommodate a baby, there are some job duties that may not be compatible with caring for a baby. Making a list of all your daily tasks can help you predict how caring for your baby may impact your job (notice I say predict, there is no way to know for sure). For example, a fussy baby and a conference call don’t mix! Even though you and your baby will probably develop a routine at work (just like at home) you will need to be able to switch from baby care to work duties and back at a moment’s notice. If you’ve read any of our past posts, you know that babies can behave unpredictably, so flexibility is very important. There are days when I just pack up and go home by lunch time because Charlotte isn’t happy or comfortable in my office. Most of the time she settles down once we get home and I continue to work there. Despite all of your planning and preparation, you may find that bringing your baby to work isn’t right for you. And, even if it works most of the time, there will be days when you will not be able to have your baby with you, so it is good to have a back-up plan. I have a few friends who I can ask to help out when I have meetings or deadlines. I have also researched day cares in my area, just in case I need to stop bringing Charlotte with me. There are many jobs and work environments that are not suitable for the kind of arrangement I have and bringing a baby to work is not right for everyone. If you think you might be in a position where you can bring your new baby to work, we hope that the list we’ve provided today will help you in making that decision. If you already bring your baby or child to work, we’d love to hear about your experience, so send us a comment!